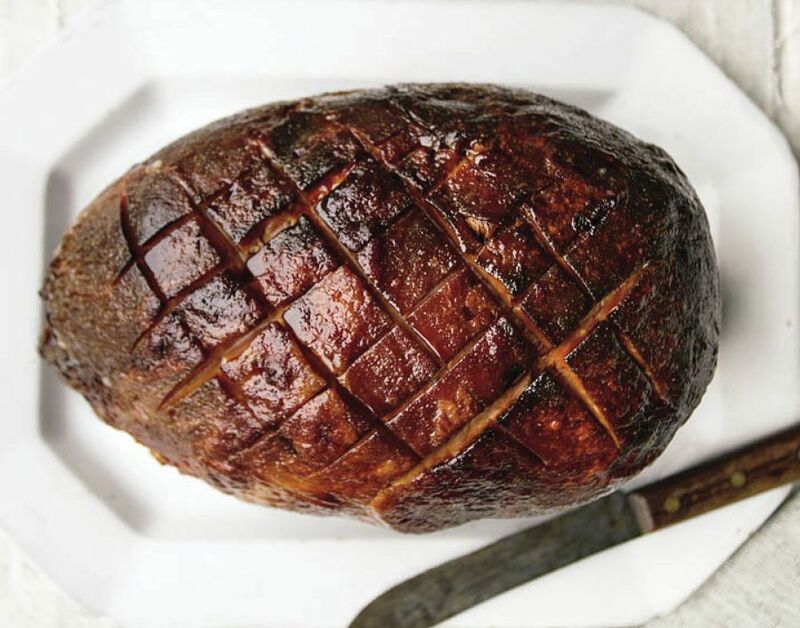 It’s never too early to start dreaming about the ultimate Easter ham, said Tom Fitzmorris in Tom Fitzmorris’s New Orleans Food (Abrams). The version below is a fixture on my holiday table—not just at Easter but at Thanksgiving and Christmas too. It’s also “without a doubt” the most requested recipe in the 25-year history of my daily radio call-in show about New Orleans food. Use the best root beer available—Barq’s if you can get it—and make the glaze the night before so you can get the ham started early the next day. That way, “it’s in the oven all morning, and makes the whole house smell good.” In New Orleans, we’re lucky to have superb Chisesi Brothers hams, but any lean, top-quality smoked boneless ham will do. Combine all glaze ingredients in a large saucepan. Bring mixture to a boil, then lower to a simmer and cook about 30 minutes. Strain pan contents and discard solids. Return liquid to pan and continue simmering until reduced to about ½ cup. If you’re preparing glaze in advance, refrigerate until ready to use. Preheat oven to 350. Place ham on a rack set in a disposable aluminum pan. Cut shallow gashes in a crisscross pattern across top of ham. Spoon glaze over ham until you’ve completely wet entire surface. Combine brown sugar and mustard and pat mixture all over ham. Pour ½ cup of water into pan. Bake the ham, spooning some of the remaining glaze over it every 15 minutes until glaze is all used up. Make sure all parts of the ham get some glaze. Periodically check water underneath the ham and add more to the pan anytime it starts to dry up. Continue baking ham for 3½ to 4 hours, until a meat thermometer shows that the ham has reached an internal temperature of 160. Remove the ham from the oven and allow it to rest for 30 minutes before carving. Serves 25 to 30.